The Pearl e Pro Live is Pearl’s entry into the world of electronic drums. It looks just like an acoustic kit, including full size drums and bright brass cymbals. But is the Pearl e-Pro Live still worth buying? How does it compare to Roland’s similarly priced offerings? How does it do when compared to getting a converted acoustic kit from the likes of Jobeky Drums or Diamond Drums? Well, you’re in luck. This Pearl e Pro Review will answer all those questions. For these were the exact questions I asked myself as I searched for a way to practice and learn the drums without deafening my family and neighbors with my acoustic kit. It’s obvious which I ended up choosing, and in this Pearl e Pro review, I’ll share my experience and thoughts on it. Looks and feels like a full size acoustic kit. Pearl’s quality hardware and big brand guarantee and confidence. Full connectivity with MIDI In and Out, plus USB. Can be converted into an acoustic kit by simply changing the heads. The metal cymbals are louder than rubber cymbals. Redbox module lacks advanced coaching or practice features. The kits do not seem equalized. Some of the sample sounds are lower quality. Alternative Products: Pearl E-Pro Live vs Roland V Drum, etc. I should point out straight away that this review is of the slightly older Pearl e-Pro kit and not the newer e-Pro Export kit. And the difference is that this one has cheaper Pearl drum shells compared to the Export shells. However, it also comes with the same Pearl rack which is a very sturdy and impressive piece of hardware. It’s also a convenient place to tie your electronic cables. 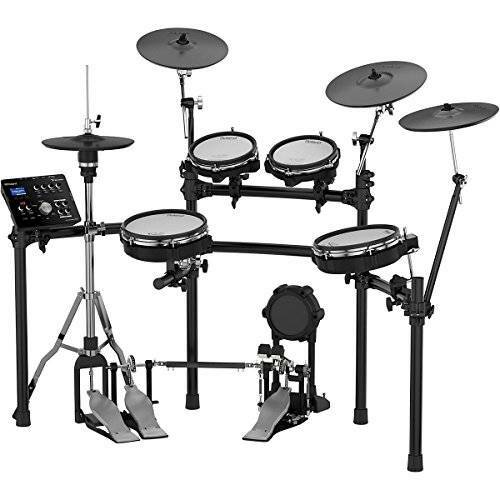 The Export edition comes with separate drum stands and has the tom toms mounted on the bass drum. 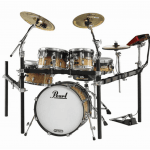 The Pearl e-Pro kit itself comprises of a 20” bass drum, 14” snare drum, and 3 toms: 10”, 12” and 14”. The snare and toms are all dual triggered on both the head and the rim. There is a 3-zone 16” brass ride cymbal, a 2-zone 12” brass crash cymbal, and a 2-zone 12” Hi-hat which attaches to the rack and comes with a detached hi-hat pedal. I did not get a bass drum pedal with this kit nor a throne or sticks. However, I was already getting this kit at a very discounted price. It did come with 5 Pearl drum bags and I also got a Pearl e-Pro rug thrown in for free! Finally, I also got the Pearl R.e.d.box sound module and all the cables, plus its own bag. 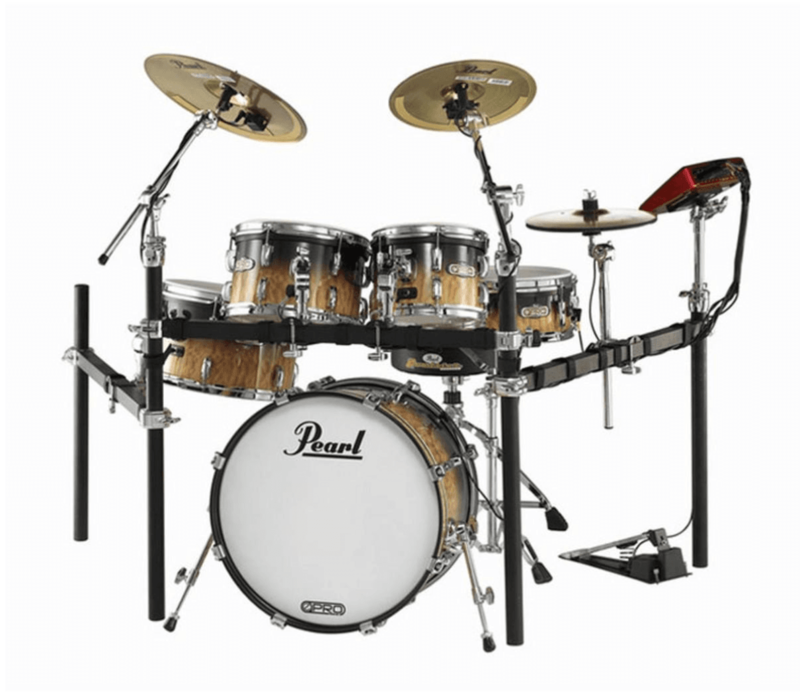 The Pearl e-Pro Live is an acoustic drum kit with Pearl’s Tru-Trac heads which triggers the electronic drum module called the R.e.d.box. I’ll go through the features of the module, or brain of the kit, shortly. First, I want to discuss the main feature of this kit, which is it’s look and size. At a glance, it does not look like an electronic kit at all. All 5 drums are the same size as an acoustic kit. The heads are the correct size and the drums are the correct depth too. Practicing feels like being on an acoustic kit. Using the ride cymbal or performing a fill involves moving your body appropriately. For me, in terms of learning to play drums, this is a big factor. 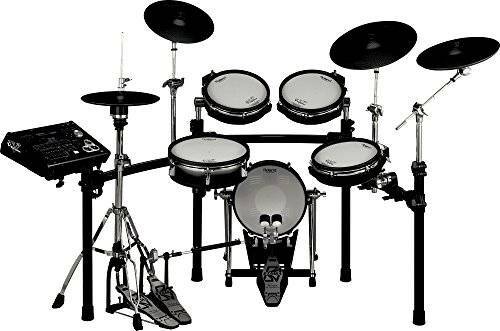 Previously, I’d been using a Roland HD-1 and using such a small kit did not help develop the muscle memory required for the positioning in playing the drums. The brass cymbals also add to the acoustic look and feel. The hi-hat does not open and close but the pedal is sensitive and sounds adjust for the hi-hat from being closed, through all the levels of partially open to fully open. As mentioned earlier, the cymbals have two triggers, the ride has an extra one for the bell and the drums have two for the head and the rim. The drums also have positional sensitivity and are much louder in the centre. The bass drum has only one trigger on a TruTrac pad which will accommodate a double bass pedal. I believe the R.e.d.box (Real Electronic Drums) module is based on the Alesis DM-10 module, as it looks very similar to it. Of course, the module has Pearl’s own samples added. It contains 1000 instruments and 100 kits with 100 user defined kits available too. There is a version 2 firmware download available from Pearl which makes it 150 kits with 50 user kits available. The main and aux outputs have their own volume controls, and the metronome click can be sent to either or both outputs. 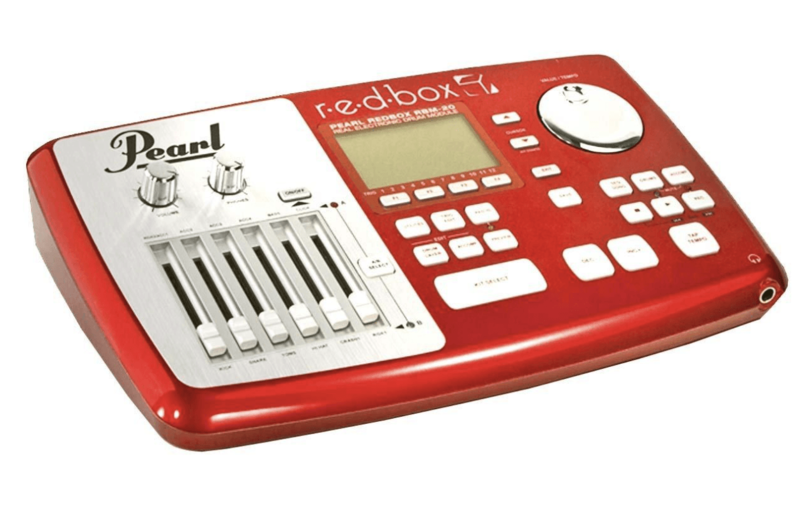 The R.e.d.box has musical sequences stored for each kit which you can play along with, and mute buttons for the drums or the accompaniments. It also has a feature called Memory Swap. This lets you connect it to your computer, unload all the kits and sounds from the module, and replace it with one high definition kit that uses all the available 128MB ram. From the Pearl website, you can get kits from Toontrack, Steven Slate Drums, and others. There is a charge for some of these kits and I have not tried this feature. For more details on the R.e.d.box, you can download a PDF of the manual here. This is available on the Pearl website. It looks and feels like a full size acoustic kit. This is great for practicing on and is designed so that it could be used on stage. You get Pearl’s quality hardware and big brand guarantee and confidence, as opposed to a customized acoustic kit from a smaller, lesser known company. It has 100 kits and 1000 sounds The kits and sounds are varied and you can even customize them. You have full connectivity with MIDI In and Out, plus USB. You can easily incorporate other devices or sample pads. It can be converted into an acoustic kit by simply changing the heads. If all else fails, you have a Pearl acoustic kit and hardware. The metal cymbals are louder than rubber cymbals. But, they’re not as loud as real cymbals. The R.e.d.box module lacks advanced coaching or practice features. There’s a click, but no coach mode, trainer, or PC software. The kits do not seem equalised and adjustments to each instrument’s volume is sometimes required when switching kits. For example, the kick might be very quiet on one kit and louder than the tom tom’s on the next kit. It is expensive. The Pearl e Pro is essentially a intermediately priced module on a moderately expensive kit (see the Pearl export for comparison) with good hardware and electronic cymbals. Is it difficult to set up? No, each cable is colour coded and labelled. The rack is square which makes it easy to tie the cables along, and it’s adjustable for positioning. The drum mounts are adjustable and come with memory locks. Does the kit fold away easily? No, but it can be stored like an acoustic kit if you take the drums & cymbals off the rack you can fold the rack up. Fold away the snare stand and stack the drums on top of each other. Can you use rubber cymbals? Yes, you can replace the brass cymbals with rubber ones or other low volume triggered cymbals. The alternative Pearl e-Pro Export comes with rubber cymbals. Does it come with a kick pedal and will it work with a double kick pedal? No, it does not come with a kick pedal. It does work with a double kick pedal (that’s what I’m using). The trigger area is quite large and just as responsive for each pedal. Does it come with a throne? Does this kit come with a choke on the crash and ride cymbals? Yes, there is no choke on the hi-hat though. There are two types of alternatives to the e-Pro Live: one is a pure electronic kit from Roland or Yamaha, etc., while the other is a converted kit from Jobeky or Diamond. Price-wise, the e-Pro Live is comparable to the Roland TD-25KV. The TD-25 module only has 18 kits and 233 instrument sounds compared to the Pearl’s 100 kits and 1000 sounds. The Roland TD-11 is cheaper and has 50 kits and 190 sounds but these are shorter, lower quality samples. I haven’t listened to the Pearl and the Roland side by side to do a proper comparison, but here is my full review of the Roland TD-11. The Pearl e-Pro also has MIDI in and out whereas the Roland’s only have MIDI out. The next Roland up is the TD-30KV and this is as almost as expensive as it gets with regular e drum kits. But: it has MIDI in and out and 100 kits and 1000 sounds plus much more. Here is my full review of the TD-30KV. Personally, I don’t think they compare at all in terms of size look and feel. Of course, if you want a compact drum kit, then the Pearl is not the way to go. Jobeky drums provide full-size converted acoustic drums which can link to any Roland module or a 2Box module. Jobeky can provide a full kit with a choice of modules and a choice of cymbals: rubber, brass, or dark bronze. I was very tempted with Jobeky, even though they were a little more expensive, as I’ve had a go on a demonstration kit and was very impressed. A standard kit with a TD-11 is cheaper than the Pearl e Pro – the TD-25 is about the same price as the Pearl. Diamond drums provide converted kits as well, although, you may have to buy the module and cymbals separately. Diamond will also convert your current acoustic kit for a reasonable price. Both Diamond and Jobeky use mesh heads, which may be your preference over the rubber heads on the Pearl. If you are just entering the world of electronic kits, there are cheaper options available. If you want a compact or fold away kit then look elsewhere. If you want to go on stage or perform live, then you’d need to spend a lot more for another electronic kit that looks this good. Overall, I am delighted with the Pearl e-Pro kit. I think the feel, sounds, and look are excellent. I have had no problems with it mis-triggering or playing the wrong sample. I am practicing more than ever and I’ve already seen a marked improvement in my playing. After one particular song, I saw and heard the ride still vibrating and I choked it naturally with my hand, forgetting that I was on an electronic kit. I was playing on an electronic kit, and thought that I was on an acoustic. For me, that is the best endorsement about this kit. Do you have any questions about my Pearl e Pro review? Send your inquiries down below. Feel free to ask me or share your comments about this review or the product itself. Hey, I'm Yannick, and I want to help you become the awesome drummer you can be!